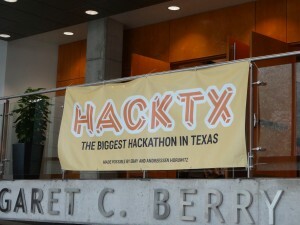 Held at the University of Texas at Austin, the 2013 HackTX hackathon yielded noteworthy ideas, prototypes, and business plans. There were greater than 425 hackers in attendance at the 24 hour event all competing to create the most innovative hack. 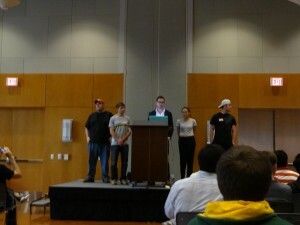 Finalists presented today in front of a room of their peers and judges, Brett Hurt, Josh Baer, and Bob Metcalfe. Below are the finalists and winners of the event. Not only was relevent XKCD a funny presentation but the team has some serious potential as a search engine technology – fuzzy searching – searching when exact results are not known. Solving the room reservation problem found in libraries and co-working spaces, Alert Meet uses motion sensing to let you know when a reserved room is in fact empty and available. Using Google Glass, this program uses face recognition to upload and save information (Linkedin profiles, etc.) for you to reference later. Allows users to simply upload files to share with others using a specific code. However, the files only remain available for a maximum of 10 minutes. Ironically, this group found that the product they were developing would have been extremely helpful to have while they were developing it. Brings journalistic quality graphs and charts to everyone, allowing users to render data on the internet into graphs with no developer interaction. Glover turns the hand into a mouse with the help of a glove. The idea brought to mind images of Tom Cruise in Minority Report. Future application could potentially include mapping motion of smart TV’s and game controls. “Medicine Experiment Assistant” is a time-lapse imaging application for android that can be a key tool for drug and toxicity testing. This hack also made it simple to take the data from the lab home seamlessly. Described as “Tinder for job fairs,” this mobile app is beneficial to both recruiters and job applicants. Allowing either party to scroll through companies/applicants that will be in attendance at specific job fairs. Yefchat is a Snapchat-like feature allowing users to view files indefinitely and upload images directly from their camera roll. Though Snapchats API is not public, this hacker figured out how to encrypt and decrypt the snaps, and mentioned expecting a cease and desist letter shortly. Completely browser based, peer-to-peer file trading system with hardly any of the file ever touching a third party server. Dwopbox’s peer-to-peer capability offers users an advantage of others coming onto the system to improve speed. Harnessing the net processing power of idle cell phones, Morpeus aims to pay users to have their phones process datasets in their sleep. “Data structure visualizer” is a tool used to visualize data structures and algorithms. 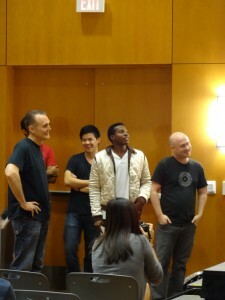 The creators feel it is a useful educational tool, and the team will open source it. Check out all of this year’s hacks here.